Given the topicality of nuclear testing, today’s entry from the shoe box files deals with General Curtis LeMay on the perils of an atmospheric nuclear test ban treaty. In 1991, Dan Caldwell and I edited a book on The Politics of Arms Control Treaty Ratification, (my concluding chapter is online) which gathered much dust during the George W. Bush administration. The lessons learned in past treaty debates may now come in handy when anticipating another try at ratifying the Comprehensive Test Ban Treaty. One recurring theme in the history of past treaty debates is how worst case military scenarios that, at the time (and especially in retrospect) seemed far-fetched, can nonetheless serve to shape “safeguards” and conditions to the congressional resolution on treaty ratification. One of the arguments used against the Senate’s consent to ratification of the Limited Test Ban Treaty in 1963 was that it would leave the United States at a grave disadvantage in the area of high-yield weapon tests. In October 1961, the Soviet Union tested a monstrous 57 megaton device. Senator John Pastore, a defense-minded Democrat from Rhode Island, and an influential voice on the Joint Committee on Atomic Energy, was inclined to test a high yield weapon, just to be on the safe side. Pastore: Do you see any military need for a 50- or 75-megaton bomb? LeMay: Yes, sir; I do. The Joint Chiefs have already recommended we go ahead with the development work on a large-yield bomb. Pastore: Is this a new policy? LeMay: It is not new as far as I am concerned. I asked for, the Air Force asked for, a high-yield bomb as early as 1954. We have discussed for a long period of time the requirement for a very large-yield weapon, and there has always been a difference of opinion about whether we should have it or not where you could do just as well with smaller weapons… In addition to that, just the mere fact that the Russians will have one will, I think, be a strong psychological factor if we don’t have one, too. Pastore and Jackson swallowed their concerns and voted for a safeguard-laden Test Ban Treaty, which passed the Senate by a lop-sided vote of 80-19. Something to look forward to: Stan Norris is working on a new biography of LeMay. War IS too important to leave to the generals. LeMay had a use. He was a trigger puller. We need trigger pullers if we’re going to have an effective military. You even need key turners. But the sad fact is out of the sub-population of people who can effectively use weapons, a large portion of this sub-population tend to put far too much credence on the utility to society of pulling triggers or turning keys. LeMay should have never made it past 1 or two stars. I have yet to see an institutional means of keeping the LeMays of the world at bay. However, by my reading of the Cuban Missile Crisis he was so bankrupt of policy to drive his attack plans that so long as you have someone even as mediocre as the Kennedy admin in charge the likes of LeMay can be kept in check. When I first read about LeMay back in the ’80’s I always wondered how he would have reacted to the nuclear devastation that would have resulted from his trigger happiness and lack of any ideas of how to act beyond use of force. Then the Neo-Cons and Bush II came into power, and I’m pretty sure I got my answer. There’d be no second guessing, or remorse. It’s a human constant that has to be kept in check. The stark nature of nuclear weapons forces the other human sub-populations to keep the LeMays in check. LeMay was literally and figuratively a ‘bomb thrower’ and represented a far (but influential)) wing of thought on national security issues of the time. One only has to wonder about what his thoughts may have been on strategic bombing and the hunt for Bin Ladin and AQ ‘senior leadership’…I would imagine the results of his take would have rendered parts of the Af-Pak border uninhabitable for 50 yrs. One big problem of developing a super-high-yield H-bomb would be how to get it to its intended target. The Soviets dragged the Czar Bomba around under a Tu-20 “Bear” bomber, but it was so large that it looked like the aircraft was carrying a Flash Gordon era spacecraft under its belly, and this couldn’t have helped drag or range one iota. A ICBM capable of carrying the theoretical “50 to 75” megaton warhead to the Soviet Union would have to have been around the size of a Titan III, and housing it in a silo would have been very challanging. The Soviets were going to deploy their super H-bomb on the UR-500 Proton rocket, but the daunting task of building the huge silos needed to house it caused Khrushchev to quip that he could either afford to build the launch silos for it or build communism, but not both at once…and cancel the program. 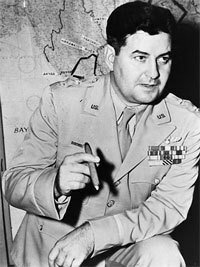 General LeMay was an outstanding military commander. He was never supposed to have been a Prophet and did not enjoy as we do the luxury of hindsight. I think people like LeMay rise to the top because they give the illusion to the population in general that an ‘expert’ is running the show. LeMay’s penchant for resorting to force kept those who lean to the right satiated with the thought that with him in charge a voice against ‘appeasement’ would echo through the halls of power. I think the same dynamic goes for the left who feel safe with appeasers in power in the name of survival. Oh how I pine for the days of the 70’s and 80’s when the New York Times, and CBS Reports (Remember ‘The Defense of the United States’?) read more like Arms Control Wonk. Let’s face it folks the level of debate in the West has dropped thru the floor. I’m already seeing the same names on this blog time after time, which tells me the number of people of any stance on the issue of armaments could not fill a basket ball gym let alone garner enough civil discourse to drive the quality of the general press up to this level. LeMay came to leadership in the age of total war and believed the Soviet Union was an existential threat to the US and the world. His views should be viewed in that light. In Gen. LeMay’s case, organizing the Berlin Airlift and developing SAC are two good answers. You do realize that if Curt LeMay had been in charge, North Vietnam would have been forced to the negotiating table in 1964; instead of 1972. If the US Air Force had carried out the 94-target plan which would’ve mined North Vietnam’s harbors with sea mines, blown up key transportation links and rail bridges, blown away the MiG fields, etc, leaving North Vietnam utterly defenseless to the USAF — this is what happened in 1972 with Linebacker II; the first couple of nights were bad, but once the logistics and transportation interdiction components of LB II, including mining the harbors had time to take effect; the danger to USAF aircraft dropped dramatically, as the North had fired off virtually all of it’s SA-2s, as well as large amounts of it’s large caliber AA gun ammo; the only things left towards the end of linebacker II were small caliber 37mm and 23mm ammunition, leaving US Aircraft free to roam over North Vietnam, blowing up what they wanted and when they wanted, because with the harbors mined and the railroads cut; there was no way North Vietnam could import large quantities of military munitions like SA-2s, or ammunition except in dribs and drabs not sufficient to pose a serious threat to US Aerial Dominance.